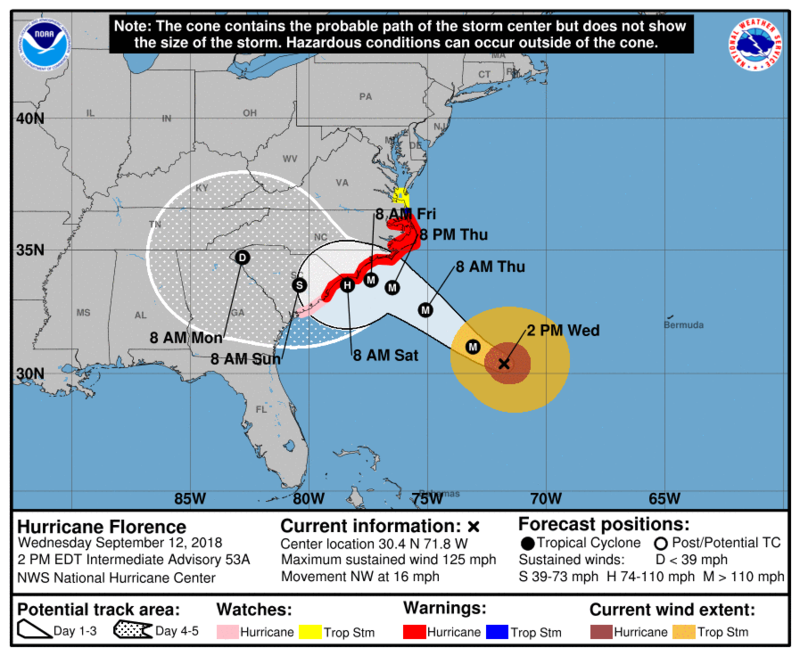 I am writing because there has been a change to the forecast path of Hurricane Florence and at this point most of Georgia is now in the 5-day cone of the forecast track. The change is due to a change in the steering air currents which are moving the storm around. While there is no change in the short-term path of the hurricane towards North Carolina and its likely landfall there late Thursday or early Friday as a major hurricane, after that the path of the storm becomes less clear. The storm is expected to stall out and weaken and several models (but not all) are indicating it may drift to the southwest along the coast of SC and possibly Georgia before turning inland as it gets caught up in an advancing cold front. 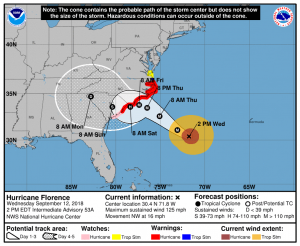 This means that the East Coast from North Carolina to Georgia could experience several days of windy conditions and heavy rain as the storm churns slowly through the area. The winds won’t be hurricane-force at that point, but could still be strong enough to cause a lot of tree damage due to saturated soils, and resulting power outages are likely. Rainfalls could be very heavy since waves of storms will move repeatedly over the area as the storm wanders around. UPDATE: Governor Deal declares “State of Emergency” this afternoon. This sounds scary but is routinely done before every big weather event to free up emergency management resources ahead of any potential emergency that might occur. That means that if an emergency does occur, the government can respond more quickly than if no declaration is made. It does NOT mean that an actual emergency is already occurring. Bring loose objects inside to prevent them from becoming airborne missiles. Check dams, ponds and lagoons to make sure they can handle several inches of rain without overtopping or eroding. If they are full, consider lowering the water levels to provide extra space for rainfall. Consider canceling or postponing events for this weekend or early next week. Even if the events are inside, people have to drive to get to them, which puts them at risk of driving through flooded or blocked roadways. Move equipment and animals to higher ground. Prepare for up to several days without power. Some people lost power for a week after Irma last year. If you have crops that are near harvest, consider trying to bring them in before the storm hits. In some cases, waiting it out may be your best choice. Local extension agents should have a better feel for the appropriate course of action than I do. The current forecast is for the biggest impacts to be on Sunday into Monday, but that could change over time, so keep paying attention to your local National Weather Service forecasts. It could drag on for quite a while. You will probably start to see impacts as early as Thursday if you are near the coast or in eastern Georgia. Since this is an evolving situation, keep watching the official forecasts from the National Hurricane Center and follow the recommendations of your local emergency managers regarding evacuations. And do not focus on how close you are to the center of the storm—Florence is several hundred miles across and impacts will be felt far from the center. Thanks and I will provide another update later on Thursday or on Friday morning.